TACOMA, Wash. — Scientists built upon a recently completed groundwater model of the Yakima River Basin to create a computer simulation that tracks well water back to its likely source area. The report on the model was authored by the U.S. Geological Survey and produced in cooperation with the U.S. Environmental Protection Agency. Responding to community concerns about high levels of nitrates found in groundwater wells in the Lower Yakima Valley, local, state and federal agencies developed a preliminary assessment and recommendations for decreasing future nitrate levels in the water. In order to decrease the levels of nitrate, the agencies recommended as the first step the identification of the sources of the nitrates. The USGS began a study in 1999 of the groundwater resources of the Yakima River Basin, a 6,200-square-mile agriculturally important area that includes parts of Yakima, Kittitas, and Benton Counties, and part of the Yakama Indian Reservation. The last of several products of the 12-year study was the first comprehensive groundwater flow model for the entire basin, which integrated the results of over a decade of scientific work and can simulate the groundwater flow system and its interaction with rivers and streams. In 2010, the EPA collected water samples from many sites in the area and identified 121 locations as having exceeded the nitrate maximum contaminant level of 10 milligrams per liter. Identify locations where nitrates applied to land surface may contribute to nitrate concentrations measured in groundwater samples that exceeded the EPA drinking-water standard. The particle tracking tool analysis in the study was used only to track the source of water to a small number of wells, but it can also be used to identify the source of water from any other simulated location. The model showed that high nitrate application rates are most likely to contaminate drinking water wells located between the source area and the Yakima River, particularly if the wells are completed and screened in the shallow basin sediments. The model also showed that water in the identified contaminated wells typically comes from areas farther away from the Yakima River than the well location, with shallow wells drawing more recent water from nearby areas and deeper wells drawing older water from farther away. Most of the wells in the simulation received their water from aquifer recharge that took place less than three miles away and less than 10 years ago. 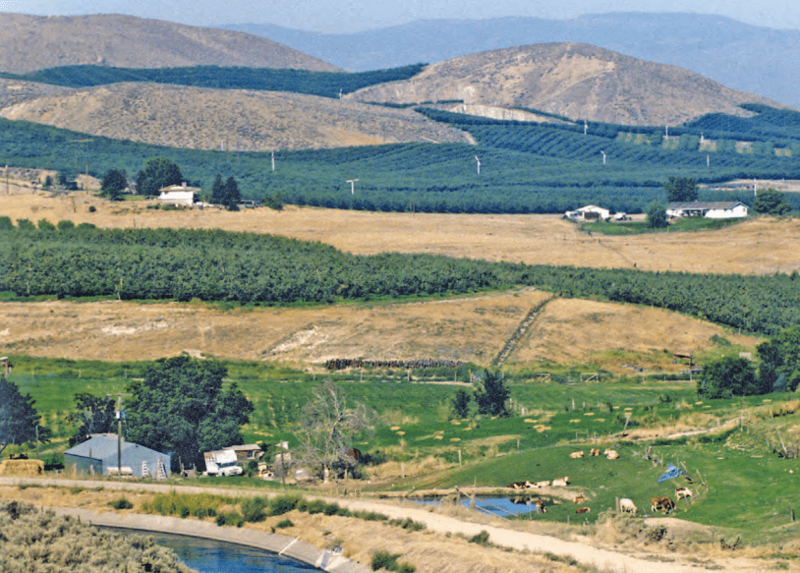 A 2012 analysis done by the EPA indicated that about 95 percent of the nitrogen applied to the land in the Lower Yakima Valley is from agriculture, and over half is from dairies. The USGS model predicts that, in most cases, any reduction of nitrogen loading rates at aquifer recharge locations should result in reduced nitrate concentrations in the drinking water wells in a 2- to 10-year timeframe. In the future, the USGS model could be enhanced with a contaminant transport component, which would allow more specific prediction of how changing the nutrient loading rates on the land surface would affect nitrate concentrations in drinking water wells. The report, “Particle Tracking for Selected Groundwater Wells in the Lower Yakima River Basin, Washington,” by M.P. Bachmann, is published and available online as U.S. Geological Survey Scientific Investigations Report 2015-5149.